The C.O. 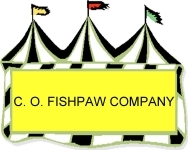 Fishpaw Company, established in 1937, has been serving communities in the tristate area of Maryland, Pennsylvania and Virginia by providing quality products and services to fundraising efforts crucial to Volunteer Fire Departments, schools, churches and civic organizations. We also service the public for private parties and special events. Whether a large event or a small event, our expertise provides our customers with a stress-free experience that ensures successful events. From Westminster: Rt 97N to Rt 496. Turn right at light. First drive on right. From Littlestown: Rt 97S to Rt 496. Turn left at light. First drive on right.